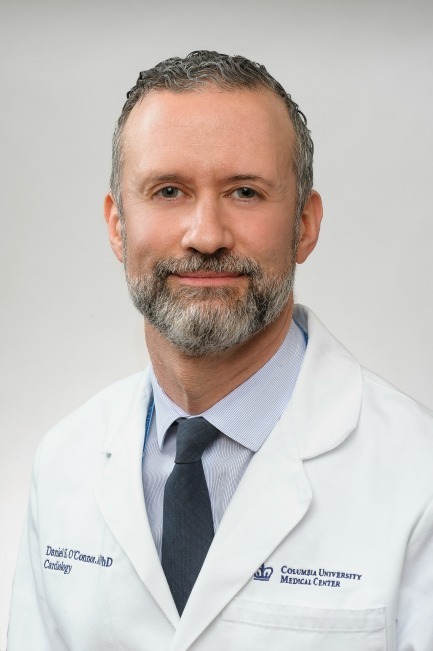 Daniel S. O'Connor, MD, PhD is an Assistant Professor of Clinical Medicine at Columbia College of Physicians and Surgeons, Co-director of the Center for CardioOncology, Cardiologist for the Aortic Program and Cardiac Intensivist at Columbia University Medical Center in New York. His areas of expertise include consultative cardiology, critical care cardiology, and non-invasive imaging. Dr. O'Connor is board certified in internal medicine and cardiology. Dr. O'Connor received his PhD studying vascular and cancer cell biology within the Department of Pharmacology at Yale University. He then received his MD degree at The State University of New York at Brooklyn Medical Center (SUNY Downstate). Dr. O'Connor was an Intern, Resident and Chief Resident at Mount Sinai Medical Center in New York. He then completed his training as a Fellow and Chief Fellow in cardiovascular medicine at Columbia University Medical Center. O’Connor DS, Schechner JS, Adida C, Mesri M, Rothermel AL, Li F, Nath AK, Pober JS, Altieri DC (2000). Control of apoptosis during angiogenesis by survivin expression in endothelial cells. Am. J. Pathol. 156(2):393-8. Papapapetropoulus A, Fulton D, Mahboubi K, Kalb RG, O’Connor DS, Li F, Altieri DC, Sessa WC (2000). Angiopoieten-1 inhibits endothelial cell apoptosis via the Akt/survivin pathway. J. Biol. Chem. 275(13):9102-5. Gratton JP, Fontana J, O’Connor DS, Garcia-Cardena G, McCabe TJ, Sessa WC (2000). Reconstruction of an endothelial nitric-oxide synthase (eNOS), hsp90, and caveolin-1 complex in vitro. Evidence that hsp 90 facilitates calmodulin stimulated displacement of eNOS from caveolin-1. J. Biol. Chem. 275(29):22268-72. O’Connor DS, Grossman D, Plescia J, Li F, Zhang H, Villa A, Tognin S, Marchisio PC, Altieri DC (2000). Regulation of apoptosis at cell division by p34cdc2 phosphorylation of survivin. Proc. Natl. Acad. Sci. USA. 97(24):13103-7. Fortugno P, Wall NR, Giodini A, O’Connor DS, Plescia J, Padgett KM, Tognin S, Marchisio PC, Altieri DC (2002). Survivin exists in immunochemically distinct subcellular pools and is involved in spindle microtubule function. J. Cell Sci. 115(Pt 3):575-85. O’Connor DS, Wall NR, Porter A, Altieri DC (2002). A p34cdc2 survival checkpoint in cancer. Cancer Cell. 2:43-54. Wall NR, O’Connor DS, Altieri DC (2003). Surpression of survivin phosphorylation on Thr34 by Flavopiridol enhances tumor cell apoptosis. Cancer Res. 63(1): 230-235. O’Connor DS, Elmariah S, Aledort LM, Pinney SP (2010). A case of disseminated intravascular coagulation complicating Epstein-Barr Virus infection in a cardiac transplant recipient. Transplantation Proc. 42 (5) 1973-75. O’Connor DS, Kaplan A, Park M, Young W, Nawasaka C, Adler E (2010). Notch signaling influence early cardiac conduction system speciation. Keystone Symposium. O’Connor DS, Green P, Rosner GF, Ginns JN, Rosenbaum MS (2012). Referral rate for pulmonary valve replacement in adult patients with pulmonary stenosis who have undergone childhood valvotomy: A single adult congenital heart center’s experience. ACC Chicago. O'Connor DS, Ginns JN, Quaegebeur J, Bacha E, Rosenbaum MS (2013). Resection of Right Ventricular Outflow Tract Patch during Pulmonary Valve Replacement Improves Right Ventricular Volumes and Ejection Fraction in Patients with Tetralogy of Fallot. ACC San Francisco.